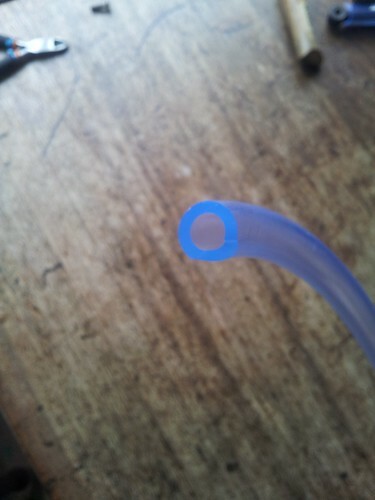 Put thick plastic tubing on the racks rails so their diameter is the same as the gurt big hooks on the Ortlieb panniers. 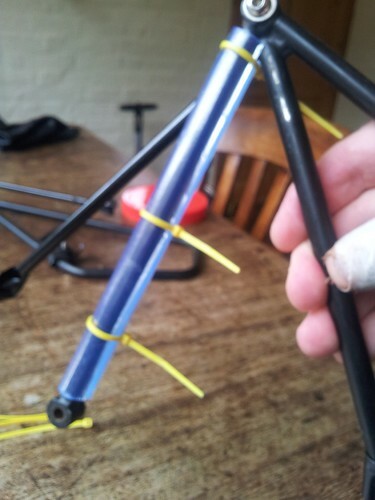 some black spinnaker tape to make it look "proper" and Bob's your uncle. so now those small tiny little miniature inserts from Ortlieb can go back into the bottom of the panniers and stop falling off/out/slipping sideways as they do. Was this worth a fiver and an hour or so of fettling? Maybe. Of course I could have just bunged some Araldite on the little inserts so they didn't move, but then they'd be there for ever and one day I might want to remove them. No, this is brilliant. I've never had a problem with the inserts, but have several perfectly good racks with inconsistent diameter tubing, and shimming the rack rather than the hook solves this neatly. Oh yes ! That is neat. I echo Kim's comments exactly. Never had a problem with the inserts (though they are fiddly to remove from the pannier hook. Getting tooled up for our last (only) family touring adventure last Summer was mildly tiresome because of the need to switch a whole bunch of the inserts over. Yup solved the problem with some inner tube and zip tie. inner tube and zip tie. I'd be interested to hear how that works because I tried it with some soft foam (found in a rubbish bin in Chile and used to protect the bike on the flight home) and experience of its use left me deciding that rigid, hard plastic was needed rather than something soft such a inner tube rubber. I think I'll get David to try something like this. We have Ortliebs and both thick and thin racks. Judicious measuring of aforesaid racks' thickness and careful ordering on eBay should see you with racks of varying thickness end up all the same thickness, hence obviating use of fiddly inserts. Now, if only someone could work out how to change the Ortlieb closing system so the small clip was on the out-board of the pannier instead of on the in-board side, that would be really good. Then when we had undone the pannier to extract something, we wouldn't have to spend ages lifting up all the kit strapped to the top of the rack to find the small tiny little miniature clip and then join it to the strap. This is how Vaude panniers work and it's a much better system, far more convenient. This is fine until you commit n+1 and end up with something that takes a custom rack in a tube diameter that's different from all the others. I fear that might involve aggressive Sewing. Though the obvious bodge is to get another pair of compatible clips and a length of webbing, fit it as an extension to the inboard clip, and shorten the outboard strap to compensate. It works just fine, nice and snug, no rattling. I think it has been on for four years on mine and heavy used. On Pelis not so long and used. But it worked just great for our tour, no sign of wear or tear. Do you want a snap? obvious bodge is to get another pair of compatible clips and a length of webbing, fit it as an extension to the inboard clip, and shorten the outboard strap to compensate. Aha! Brilliant idea. I'm on the case. Am away in forrin parts (sans bicyclette) for next few days, will look at this on my return. In fact I now realise that Ortliebs come with that shoulder strap, which in my case live in the bottom of the pannier and are hardly ever used. So I shortened it and ran the surplus strapping underneath the rubber protector for your shoulder (to keep it out of the way), and clipped it to the buckles on the pannier. 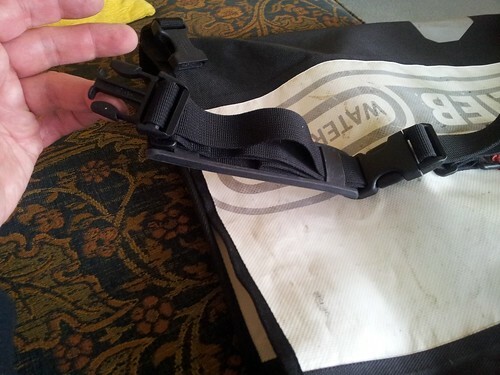 So now I think the strap can be fastened to the inner clip on the pannier with a length of strap that is sufficiently long to obviate the need for rummaging underneath the messy pile of tent, mat, Ikea bag of Stuff that sits on top of the rack while cycle touring. 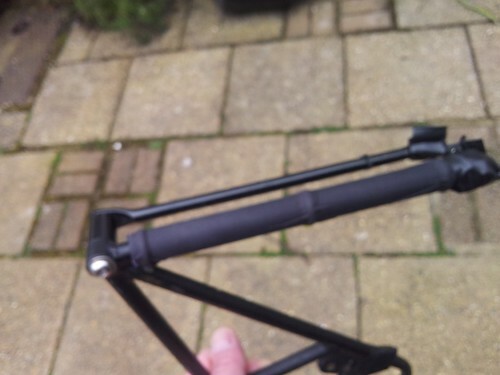 If I use the audax bike with the rear rack on Thursday night I'll put the pannier on and be able to offer it to Kim OTP for critical inspection. I bodged something beautiful using clips and a bit of spare tape. Not needed on the front Ortliebs as they are never involved in Stuff hanging sideways on the rear rack, but the rear ones look great. The second pannier took five minutes, the first one about half an hour as I worked out what I wanted and how to get it. Here's a closer look at the "inside" clip. And here's the crucial clip on the outside - I had to unscrew the bolt (flat-end screwdriver and spanner needed) and force the screw through the new bit of tape and force the screw back into the bolt on the inside of the pannier. And in case you're wondering, the cord marks the pannier that goes on the left - a sort of lilac coloured cord, it's red for right. I just wish I'd got round to doing this before the seven-week camping trip to Norway, where it would have been useful. Vaude panniers have the clip on the outside, by the way. The Ortlieb rack top bags use those clips. You'd need to modify the bag if you ever got one. I don't find this to be a problem anyway as it's no less inconvenient routing around inside the pannier with luggage atop either. I admire your ingenuity though.